Ideally, I will visit your animal in its own environment where it is likely to be more at ease. It is best if the animal is in a place where it can go to sleep or rest if it wishes after the healing has finished. I travel to Surrey, Sussex, and Hampshire, and further afield by arrangement. I also do distant healing for animals that I cannot travel to, and this is equally effective as healing in person. I do not have to place my hands on the animal, but can work from a short distance, or from outside a paddock or kennel, or cage. Healing works best with a course of treatments at roughly weekly intervals. Trauma is stored like layers of an onion, and it may take a while to access the underlying cause. Therefore I suggest a minimum of three treatments in order to see lasting results, however individual animals respond differently and each case is unique. A treatment usually lasts 45 minutes to an hour. I am guided by the animals’ responses as to when it has had enough. I will complete a detailed consultation form and on-going notes to track your animal’s progress. What animals can healing treat? Healing is beneficial for all species of animals, including reptiles, amphibians and birds. I have worked with all types of pets, from a goat to a tortoise. 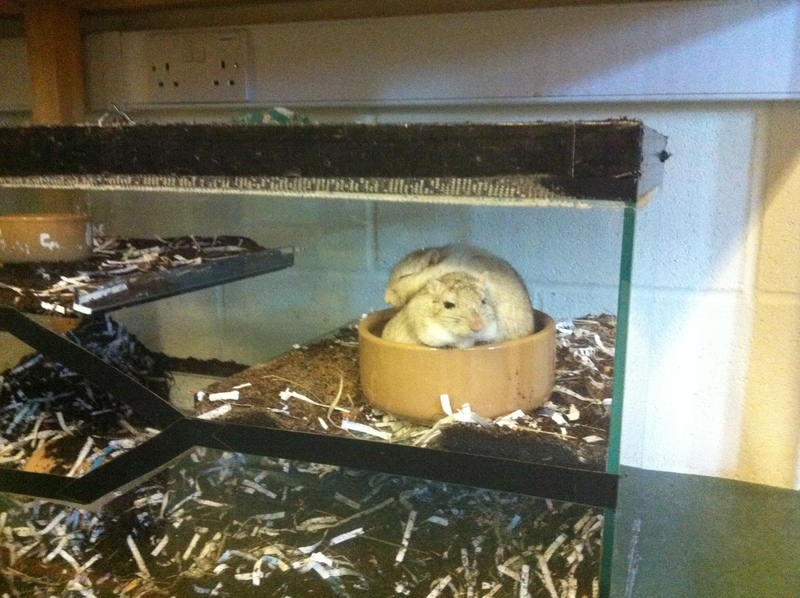 During their healing, these two gerbils climbed into their feed bowl and went to sleep. Travel up to 20 miles from RH12 3ES is included in the treatment price. Thereafter 45 pence per mile. Please be aware that for cancellations made with less than 24 hours notice you will still be charged the full treatment/consultation fee. I am fully insured with Balens, and remain up to date with continued professional development. I am a member of the Asentia College of Animal Healing, which is a member organisation of The Confederation Of Healing Organisations. I am bound by the Code of Conduct of the Asentia College of Animal Healing.